Ruedrich's Red Seal Ale | North Coast Brewing Co.
Ruedrich's Red Seal Ale | North Coast Brewing Co. poured from the bottle into a pint glass, this has a two finger thick off-white head, solid lacing& a copper amber body. I smell hearty, sweet malts with mellower hops. Tastes pretty similar to the aroma. Smooth clean finish. Medium mouthfeel with mild carbonation. I'll choose to rate Ruedrich's Red Seal Ale | North Coast Brewing Co. with a 4. Pours a clear dark amber with a tinge of red, head sits at about 3/4's to 1 inch at the top. Very pleasant and encouraging scent, rooty initial flavor, malt dominant, it drinks exceptionally clean like a wheat beer. Carbonation is minimal and aftertaste is light and inoffensive. All in all a great ale, hope to make it a mainstay. Bottle dated 7/10/17. Old as hell, but it’s hard to find around here. CBF pint. A: pours a clear reddish copper with streams and streams of carbonation. One finger thick, foamy beige head. Rings of lacing as I drink it down. S: sweet and citrusy. Candied orange. Sugary malt. Smells like the Three Frogs I had a few weeks ago, or like the Sam Smith’s IPA. What they have in common is that they were all old hoppy beers around 45 IBUs. Classic APA aroma. T: tastes shockingly like those two aforementioned. Moderately sweet, citrus, malt, floral arrival. Toasted caramel malt and cascade hop flowers on the middle. A crisp, clean finish with a faint hint of lingering hop. I’ll bet this has more citrus “pop” when fresh. Alas, it was between a six pack at five months old, or a single of unknown age (which turned out to be 10 months). Lacks the darkness or dankness that GL Burning River brings to the table. M: solidly midweight with high, but not excessive carbonation. Very clean finishing. Not very slick. Way crisper texture than Ridge Trail. O: this, even more than Sam Adams Boston Ale, GL Burning River, or Wolf’s Ridge Ridge Trail typifies the ubiquitous pale ales of the late 90s. It is a style that takes me back, and reminds me of many happy pints with friends. It is a beautifully executed example, and a shame beers like this have lost so much popularity. I hope it won’t continue to be so hard to find, and would gladly buy a six pack, as it clearly holds up to age fairly well. Great Beer, had it on tap with chicken pesto. Great combo, balanced flavor, nice color, flavor and mouthfeel. This beer is hard to find in the Upper Midwest. Would love to have it on hand for my beer fridge. 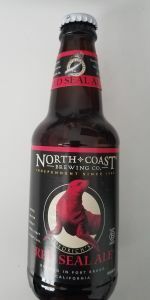 Ruedrich's Red Seal Ale from North Coast Brewing Co.